The 3rd issue of Low Carb Direct magazine is now available! Read or download your copy here. My article, Can Coconut Ketones Prevent and Treat Alzheimer’s? starts on page 20. Close your eyes and tell me what you see when I say comfort food. Did you see potatoes? Chances are they were mashed with a pool of butter or gravy on top. Or perhaps the spuds in your mind’s eye were deep-fried, crispy and brown, and cozied up to a little paper cup of ketchup. The USDA reported that potatoes are the most commonly eaten vegetable in America. (http://time.com/2818849/these-are-the-most-popular-foods-in-america/) Tomatoes, another member of the nightshade family, came in a distant second. Our rocky love affair with potatoes started a long time ago (7,000 years at least) in the rugged Andes mountains of South American where the soil was poor and thin and the climate was harsh. The indigenous people had already domesticated the potato when Francisco Pizarro and his band landed in Peru in 1532. The Spanish Conquistadors took a few of the tenacious tubers back home to Europe with them, probably ones left over from their own provisions for the voyage. McDonald’s used almost pure beef fat for their fries until 1990 when fear of saturated fat led them to switch to hydrogenated trans fats. Oops. When trans fats proved to be much worse, rather than going back to natural, saturated fat, they opted for a frying medium made mostly of PUFAs. Their current label lists canola, corn, soybean, and hydrogenated soybean oils with TBHQ and citric acid as preservatives and dimethylpolysiloxane to reduce splattering and make clean up easier. In addition to potatoes, the actual fries contain canola and hydrogenated soybean oil, natural beef flavor (derived from wheat and milk), citric acid (a preservative), dextrose (i.e., sugar), sodium acid pyrophosphate (to maintain color), and salt. Vats of unstable fats kept at high temperatures, often for days at a time, can react with everything they contact, producing an unknown and unknowable slurry of potentially toxic new chemicals. The food industry went, as Nina Teicholz says, from the fat to the fire. (Nina Teicholz, The Big Fat Surprise, 2014). Eliminating potatoes leaves a big hole on our plates. What can we eat instead? Quite a lot, actually. And you may be surprised to find that they are better than the high-carb potatoes they replace. Below is one of my favorite alternatives for french fries and I’ve listed some of the most popular potato substitutes from my books and blog at the end of this post. You can find many more online. After reading The Big Fat Surprise (Nina Teicholz, 2014). I swore off fried foods except the ones I cook myself. Even under the best of circumstances, frying is not the most healthful way of cooking, but if you use fresh, heat-stable fat, it can be done more safely for an occasional indulgence. 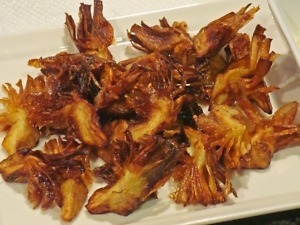 Wash and cut off the stems from fresh baby artichokes. Cut off and discard the top third of each artichoke. Peel away the green outer leaves until only a yellow-colored cone remains. Trim the remaining leaves with kitchen shears to remove any tough tips or thorns. Drop the fresh artichokes into a bowl of water with two tablespoons of lemon juice to prevent browning. Drain artichoke hearts and trim away any tough outer leaves or leaf tips if necessary. Cut fresh or prepared artichoke hearts vertically into eight narrow wedges. The jarred ones may be available already quartered so you only need one additional cut per piece. You want narrow wedges with the leaves intact so they will fan out and crisp up. Drain and gently blot them between paper towels to get out as much of the liquid as you can, so they won’t splatter. Prepared artichokes will be soggier than fresh, so upend them on paper towels and let them air dry on paper towels for several hours or overnight. Heat the fat to 360º F and fry the artichokes in several batches until brown and crisp. Dip out with a spider or slotted spoon and drain on paper towels. Place in a warm oven until all are cooked. Sprinkle with salt and serve hot. Fat content of drained artichokes is estimated. 1. All fats contain a combination of saturated, monounsaturated, and polyunsaturated fatty acids. Beef and lamb tallow, cocoa butter, and palm kernel oil are the most saturated and therefore the most stable to use for frying. Coconut oil is the most saturated fat of all, but some brands list a smoke point of 350º F and set a limit of medium-high heat. Monounsaturated fats, like lard, schmaltz (poultry fat), avocado oil, and olive oil are next. Olive oil is mostly monounsaturated. Virgin or light olive oil can tolerate more heat without breaking down, but it will have lost some of its health benefits. Extra-virgin olive oil is best reserved to use raw on salads. 2. Don’t throw away the most flavorful and healthful part of your food! You can purchase good fat but why buy it if you can get it for free? When you cook good quality meat or poultry, strain the pan drippings into a container. Chill them so the solid fat rises to the top and can be lifted off. Refrigerate and use for frying, baking, and making salad dressings and sauces. Here is a list of some of the most popular potato subs from my books and blog. You can find many more online. This article appeared first in Low Carb Direct Magazine, Issue #2, September, 1, 2016. French fries, Low Carb Direct Magazine, Mashed potatoes, Potato substitutes. Bookmark. This blog is beyond retarded. Hi Phil. Could you expand on your complaint?